Sergeant Rafael Hernandez Marin was born in Aguadilla Puerto Rico on October 24th, 1892. As a child, he earned his living by making cigars, but by twelve was able to fulfill his love of music by studying in San Juan. 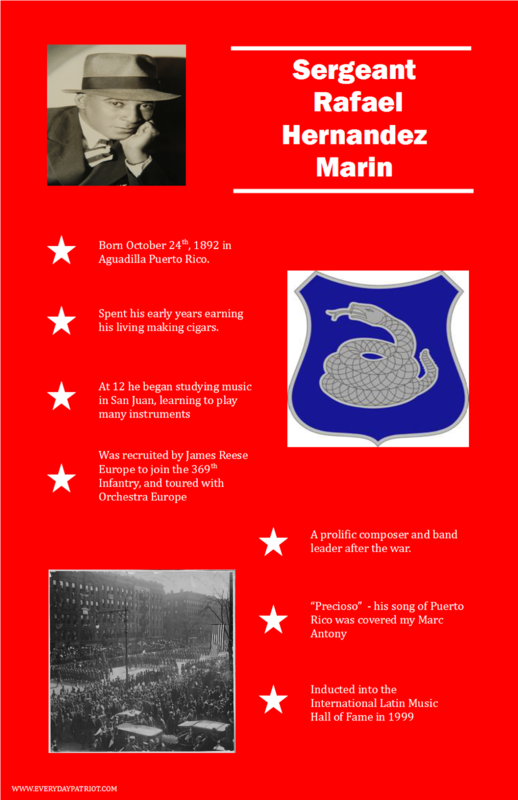 Sergeant Marin could play several instruments, including the clarinet, tuba, trombone, violin, piano, and guitar and by fourteen was playing for the Cocolia Orchestra. While working as a musician in North Carolina, James Reese Europe, a Jazz bandleader, recruited him, his brother Jesus and other Puerto Ricans to join the Orchestra Europe, the military band of the 369th Infantry, known as the Harlem Hellfighters. Orchestra Europe is considered to be the band that started the love of Jazz in Britain and France. After the war, he formed several bands, and continued to compose. He also directed the Teatro Fausto in Havana, studied at the Mexico National Music Conservatory and was the director of the Orchestra at WIPR radio, Puerto Rico's government-owned station. 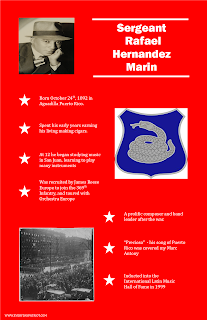 Sergeant Marin is also considered to be the founder of little league baseball in Puerto Rico. He died of cancer December 11th, 1965 and was posthumously inducted into the International Latin Music Hall of Fame. He is considered to be one of the best Latin composers in the world. His song, "Preciosa", in which he describes his love of Puerto Rico was covered by Marc Antony, who sung it at Madison Square Gardens.